Much of that turmoil takes place in a huge, complicated setting called the circumgalactic medium, or CGM. This vast, roiling cloud of dust and gas is a galaxy’s fuel source, waste dump and recycling center all in one [Annual Review of Astronomy and Astrophysics]. Astronomers think the answers to some of the most pressing galactic mysteries — how galaxies keep forming new stars for billions of years, why star formation abruptly stops — are hidden in a galaxy’s enveloping CGM. Armed with the first extragalactic census, astronomers are now piecing together how a CGM controls its galaxy’s life and death. And new theoretical studies hint that galaxies’ stars would be arranged very differently without a medium’s frenetic flows. Plus, new observations show that some CGMs are surprisingly lumpy [Nature]. A better understanding of CGMs, enabled by new telescopes and computer simulations, could change how scientists think about everything from galaxy collisions to the origins of our own atoms. In a cosmic coincidence, the Hubble telescope’s chief champions were also the first astronomers to figure out how to observe a galaxy’s CGM. Lyman Spitzer of Princeton University and John Bahcall of the Institute for Advanced Study in Princeton, N.J., and other astronomers noticed something strange after the 1963 discovery of quasars [http://cosmology.carnegiescience.edu/timeline/1963] (SN Online: 3/21/14), bright beacons now known to be white-hot disks surrounding supermassive black holes in the centers of distant galaxies. Bahcall never stopped advocating for Hubble. In February 2005, six months before his death at age 70 from a rare blood disorder, he co-wrote an article in the Los Angeles Times [http://articles.latimes.com/2005/feb/23/opinion/oe-tayloretal23] urging Congress to restore funding for a mission to fix some aging Hubble instruments, which NASA had canceled after the 2003 Columbia space shuttle disaster. His plea was answered: The space shuttle Atlantis brought astronauts to repair Hubble for the last time in May 2009 (SN Online: 5/19/09). During the repair, the astronauts installed the Cosmic Origins Spectrograph, which could pick up diffuse CGM gas with 30 times the sensitivity of any previous instrument. Although earlier spectrographs on Hubble had picked out CGMs a few quasar-beams at a time, the new device let astronomers search around dozens of galaxies, using the light of even dimmer quasars. At the time, Werk reported that at least half of galaxies’ missing ordinary matter can be accounted for in their CGMs. In a 2017 update, Werk and colleagues found that the mass of baryons just in the form of cool gas in a galaxy’s CGM could be nearly 90 billion solar masses [The Astrophysical Journal]. “Obviously, this mass could resolve the galactic missing baryons problem,” the team wrote. One possibility, suggested in a paper posted online February 20 in The Astrophysical Journal, is that sprays of supernova-heated gas could get stripped from galaxies. 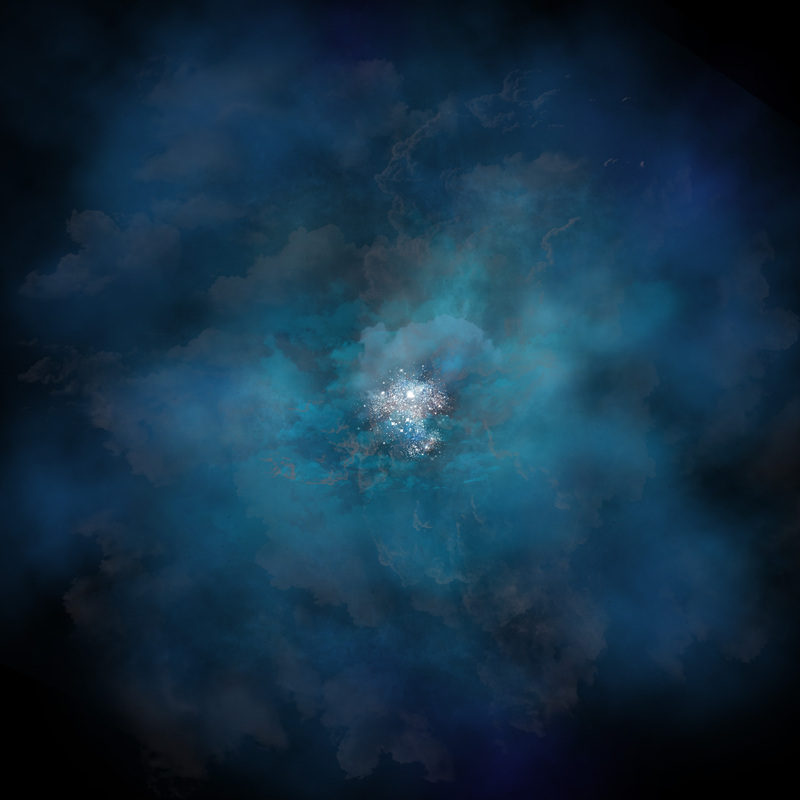 Physicist Chad Bustard of the University of Wisconsin–Madison and colleagues simulated the Large Magellanic Cloud, a satellite galaxy of the Milky Way, and found that the small galaxy’s outflowing gas was swept away by the slight pressure of the galaxy’s movement around the Milky Way. Teams using two new spectrographs — KCWI, the Keck Cosmic Web Imager on the Keck telescope in Hawaii, and MUSE, the Multi Unit Spectroscopic Explorer on the Very Large Telescope in Chile — are racing to change that. These instruments, called integral field spectrographs, can read spectra across a full galaxy all at once. Given enough background light, astronomers can now examine a single galaxy’s entire CGM. Finally, astronomers have a way to test theories of how gas circulates into and out of a galaxy. A Caltech-built instrument designed to study the mysteries of the cosmic web—streams of gas connecting galaxies—has captured its first image, an event astronomers call “first light.” The instrument, called the Keck Cosmic Web Imager, or KCWI, was recently installed on the W. M. Keck Observatory in Hawaii. KCWI captures highly detailed spectral images of cosmic objects to reveal their temperature, motion, density, mass, distance, chemical composition, and more. The instrument is designed to study the wispy cosmic web; it will also observe many other astronomical phenomena, including young stars, evolved stars, supernovas, star clusters, and galaxies. Martin and his Caltech team, in collaboration with scientists at UC Santa Cruz and with industrial partners, designed and built the 5-ton instrument—about the size of an ice cream truck. It was then shipped from California to Hawaii on January 12. 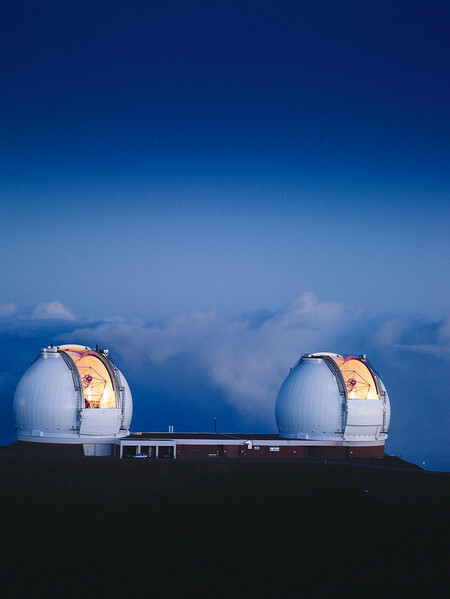 Since then, Keck Observatory’s team has been working diligently to install and test KCWI on Keck II, one of the twin 10-meter Keck Observatory telescopes. An instrument designed to image the vast web of gas that connects galaxies in the universe has been shipped from Los Angeles to Hawaii, where it will be integrated into the W. M. Keck Observatory. 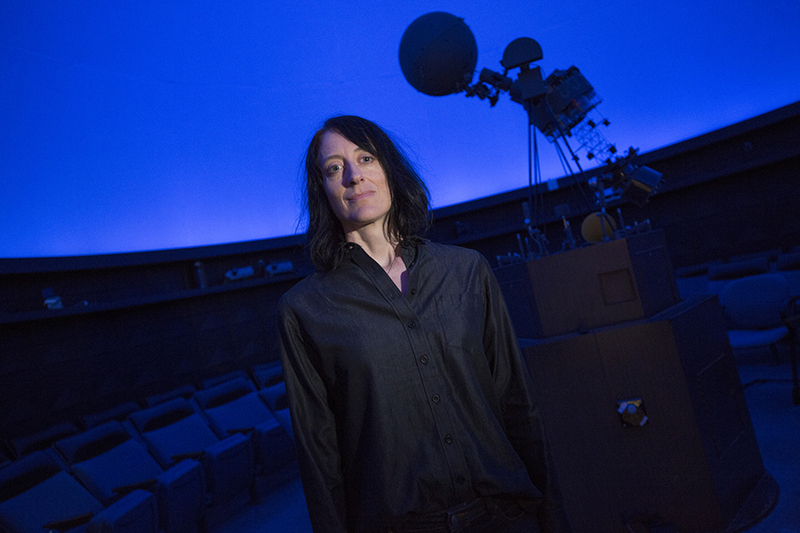 The instrument, called the Keck Cosmic Web Imager, or KCWI, was designed and built by a team at Caltech led by Professor of Physics Christopher Martin. 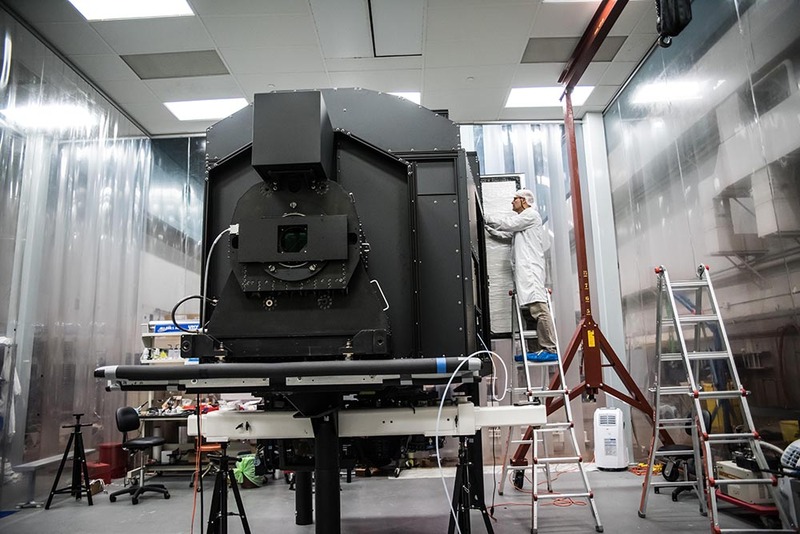 It will be one of the best instruments in the world for taking spectral images of cosmic objects–detailed images where each pixel can be viewed in all wavelengths of visible light. Such high-resolution spectral information will enable astronomers to study the compositions, velocities, and masses of many objects, such as stars and galaxies, in ways that were not possible before. One of KCWI’s main goals, and a passion of Martin’s for the past 30 years, is to answer the question: What is the gas around galaxies doing? 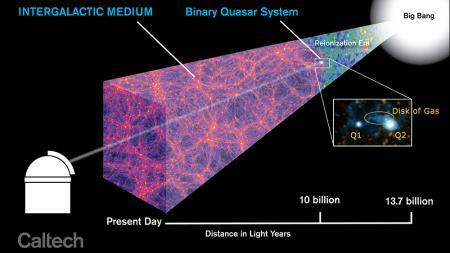 Martin and his team study what is called the cosmic web–a vast network of streams of gas between galaxies. Recently, the scientists have found evidence supporting what is called the cold flow model, in which this gas funnels into the cores of galaxies, where it condenses and forms new stars. Researchers had predicted that the gas filaments would first flow into a large ring-like structure around the galaxy before spiraling into it–exactly what Martin and his team found using the Palomar Cosmic Web Imager, a precursor to KCWI, at Caltech’s Palomar Observatory near San Diego. With KCWI, the researchers will get a closer look at the gas filaments and ring-like structures around galaxies that range from 10 to 12 billion light-years away, an era when our universe was roughly 2 to 4 billion years old. Not only can KCWI take more detailed pictures than the Palomar Cosmic Web Imager, it has other advances such as better mirror coatings. The combination of these improvements with the fact that KCWI is being installed at one of the twin 10-meter Keck telescopes–the world’s largest observatory with some of the darkest known skies on Earth–means that KCWI will have an improved performance by more than an order of magnitude over the Palomar Cosmic Web Imager. KCWI will map the gas flowing from the intergalactic medium–the space between galaxies–into many young galaxies, revealing, for the first time, the dominant mode of galaxy formation in the early universe. The instrument will also search for supergalactic winds from galaxies that drive gas back into the intergalactic medium. How gas flows into and out of forming galaxies is the central open question in the formation of cosmic structures. “We designed KCWI to study very dim and diffuse objects, our main emphasis being on the wispy cosmic web and the interactions of galaxies with their surroundings,” says Mateusz (Matt) Matuszewski, the instrument scientist for the project. Scientists and engineers have been busy assembling the highly complex elements of the KCWI instrument at Caltech since 2012. The instrument is about the size of an ice cream truck and weighs over 4,000 kilograms. The core feature of KCWI is its ability to capture spectral information about objects, such as galaxies, across a wide image. Typically, astronomers capture spectra using instruments called spectrographs, which have narrow slit-shaped windows. The spectrograph breaks apart light from the slit into each of the colors making up the target object, just like a prism that spreads light into a rainbow. But traditional spectrographs cannot be used to capture spectral information across an entire image. KCWI has the highest spectral resolution of any integral field spectrograph, which means it can better break apart the rainbow of light to see more colors, or wavelengths. The first phase of the instrument, now on its way to Keck, covers the blue side of the visible spectrum, spanning wavelength ranges from 3500 to 5600 Angstroms. A second phase, extending coverage to the red side of the spectrum, out to 10400 Angstroms, will be built next. KCWI is funded by the National Science Foundation, through the Association of Universities for Research in Astronomy (AURA) program, and by the Heising-Simons Foundation, the W.M. Keck Foundation, the Caltech Division of Physics, Mathematics and Astronomy, and the Caltech Optical Observatories.